Hi everyone! 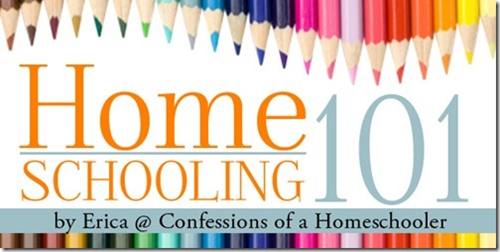 I’m back today with another Homeschooling 101 post for you! Last time around we discussed Gathering Curriculum, so today we’re going to talk about what to do with it! Organizing all of those fun school supplies is my favorite part of homeschooling. Preparing your school area is not only fun, but also a wonderful way to start the year. Kids will get excited about the prospect of a new year, and you as the teacher will rest comfortably knowing that your school area is organized and ready! There are tons of different ways to homeschool, and with it are just as many places to homeschool. Some families do school in the kitchen, some at the library, and some outside if the weather allows. 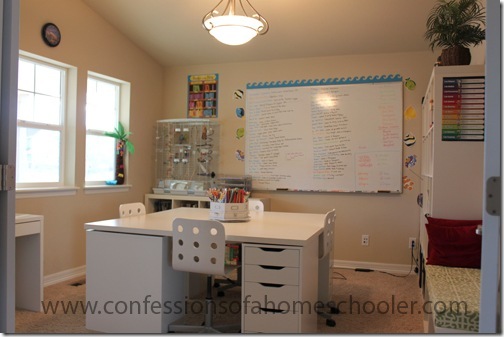 Some people even have a room or specific area of the home dedicated to homeschooling. Whatever the Lord has blessed you with; make the most of your space. Wherever you choose to do school, set it up in such a way that it makes sense to you, so things will be easy to find. Also try to make sure everything has a place to be stored so you don’t have clutter hanging around on a regular basis. Having some order will help you find things during school, as well as make it easier to put things away after school. Making your space functional is key because as any veteran homeschooler will tell you, homeschooling can get a little crazy. And digging around in a pile of chaos during the middle of a lesson is not ideal. So I am going to give you some basic tips on how we organize our homeschooling space that will hopefully help you get started. I will try to address as many areas as I can, but keep in mind some may or may not fit with the needs of your family. Please don’t feel like you don’t have the capability to homeschool just because you don’t have a formal homeschooling area. There are many different options when setting up a homeschooling area. The first thing to consider is the workspace for your students. All homeschoolers will need an adequate space to work. This is especially important for younger students who are still learning how to write and need a more ergonomically correct environment. When my children were first starting out, we purchased small individual desks for them which was fine while they were younger. But as they got a bit older it became apparent that we really needed a bit more space to spread out books and supplies during lessons. We eventually settled on a larger communal type desk for everyone that allowed us more room to spread out. Think about what your family’s needs will be, and take into account the long haul so you don’t waste money on something that won’t be useful in a year or two. Keep in mind that your kitchen or dining room table works just as well, so don’t feel like you have to go out and spend money on school desks in order to be successful at homeschooling. You can see our workspace in more detail in these posts on Our School Room. Oh beloved storage space! While it is possible to have a more minimalist approach to homeschooling, you will still need some type of storage for books, supplies, and student materials. Some people manage to store everything in the cabinets in their kitchen, some use drawers under counter tops. And others, like us, have an actual school room. Whatever area you have designated for school, organized storage can be a very helpful tool. If things are stored in a functional manner it can remove a lot of stress and chaos from your day. Here are some guidelines to help you get started. I prefer the Ikea Expedit shelving units. They come in a variety of sizes and shapes to help accommodate your space. They are also sturdy and the shelf cubby holes are a great size for binders, and storing a lot of things. Of course you can use whatever is available to you, and fits your storage needs. Teacher’s Manuals: Keep teacher’s manuals in one place. Either sorted by subject, or by grade. I prefer to separate my teacher’s manuals by grade level. That way when it’s time to do a lesson for one of my students, I to go their shelving area and pull out the manual for that subject. I have also seen people put all of their TM’s in one binder with divider tabs so they’re all on one spot. Basic Supplies: Find a sensible area to store basic homeschool supplies. I keep most of our basic supplies in my desk area. For example I usually have glue, highlighters, sharpies, tape, stapler & staples, lined paper, grid paper, pencils, paper clips, scissors, calculators, Post It notes, etc., in my desk drawer. Legal Documents: Keep your annual “Notice of Intent to Homeschool” form, or your enrollment in an umbrella school, etc. in this portion of the binder. Attendance: Make sure to keep records for your student attendance and hours for each year in your binder. Receipts: Keep all receipts together for things you’ve bought for each school year. Most states don’t allow a tax write off right now, but you never know! This is also good for budgeting purposes, and it also comes in handy for proving you homeschool when purchasing from companies that give educational discounts. Lesson Plans: While this may or may not be required by your state, I like to keep a printed copy of our lesson plans for each student. I have dividers that separate out the lesson plans for each child to make it easy. 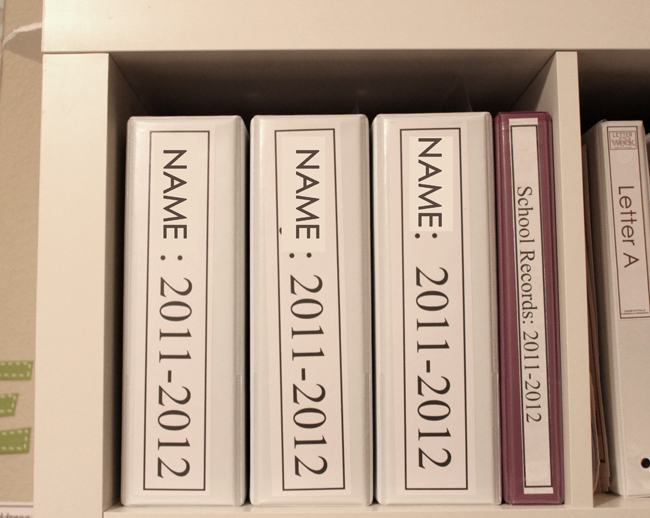 Once the year is over I bring my completed binder down and add it to a banker box containing my records from previous years. That box is stored on a shelving unit in our basement. That way these documents will be easily accessible and can be quickly located in the craziness that can take over a basement. Typically these binders contain documents that might be required by the state so I definitely want to keep these organized and easily accessible. Stick around next week when we’ll be talking about organization for your students! Great points! I love bookshelves! We store each of our kids schoolwork in a clear box and take out what they need to do each day. We used to have desks but found that they never used them. Hi, there. Thank you for always sharing such wonderful information. I was wondering if you were willing to share what the dimensions on your desk are? Thank you. FYI- we just moved and our expedit shelves were broke, I went to get a new set at IKEA and they are being discontinued! If want a set run to ikea to see what they have left. They are replacing it with a new line but the biggest size will be the 4×4 now 🙁 I was able to get a 5×5 (but in black) Thanks for all your fabulous posts Erica! Thank you for providing us with so much information. My state doesn’t require anything so it’s hard to know what I need to do. We’re likely joining an umbrella school so we will have a little guidance!